The beautiful Magnolia North Condos are located in the city of Myrtle Beach, South Carolina. The community is in Myrtlewood and it gives residents an outdoor swimming pool, a picnic area, and barbecue grills. The condos here are situated on the Myrtlewood Golf Course and many of the units feature beautiful golf course views. The condo complex is just two traffic lights from Broadway at theBeach, NASCAR Speed Park, Myrtle Waves and other major areas in the Grand Strand. There are one, two, and three bedroom condos situated inside three story buildings. There is also a HOA that includeswater/sewer and basic cable along with the grounds.There are many areas for residents to enjoy shopping, dining, entertainment, nightlife, golf, and outdoor recreation. 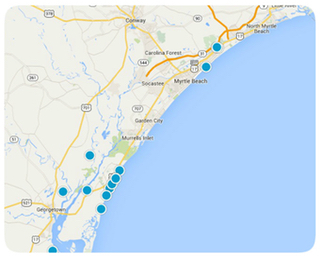 Residents are also close to all of the attractions in the Myrtle Beach area. Feel free to take a look at the beautiful condos we have available and let us know if you have any questions or interest.